No matter where you live, you live in a watershed. A watershed is the land area that drains to a single body of water such as a stream, lake, wetland or aquifer (an underground layer of water). Watersheds come in many different sizes. A few acres might drain into a small stream or wetland, or a few large rivers might drain into an estuary—where fresh water and salt water mix. The actions of people who live in a watershed affect the health of the waters that run through it. Rainfall and snowmelt wash chemicals, fertil-izers, sediment, and other pollut-ants from the land into water bodies. To achieve healthy watersheds, EPA needs the help of people like you! FrogWatch USA is a citizen science program that allows individuals and families to learn about the wetlands in their communities and help conserve amphibians by reporting the calls of local frogs and toads. For over ten years, volunteers have been trained to enter their FrogWatch USA information and ongoing analyses of these data have been used to help develop practical strategies for the conservation of these important species. Volunteer monitors are people who measure the water quality of lakes, streams, rivers, estuaries, and other bodies of water. In most programs they take water samples and either send them to a laboratory or analyze the water themselves using portable water quality test kits. Journey North is a free internet-based program that explores the interrelated aspects of seasonal change. Two Journey North projects relate to wetlands. With “Unpave the Way for Wildlife,” teachers and classrooms can help wildlife through butterfly gardening and other forms of habitat restoration. By creating these backyard refuges--on the breeding grounds, wintering grounds, and everywhere along the migratory path--you can help ensure that the annual migrations to and through your region continue. Journey North also follows migrating Whooping Cranes during their migration. May is American Wetlands Month, a time when EPA and its partners in federal, state, tribal, local, non-profit, and private sector organizations celebrate the vital importance of wetlands to the Nation's ecological, economic, and social health. It is also a great opportunity to discover and teach others about the important role that wetlands play in our environment and the significant benefits they provide - improved water quality, increased water storage and supply, reduced flood and storm surge risk, and critical habitat for plants, fish, and wildlife. Mossom Creek Hatchery is a salmon hatchery in Port Moody, British Columbia. It is a salmon enhancement project supported by Fisheries and Oceans Canada. It was started in 1976 by high school volunteers from local Centennial School in Coquitlam and teachers Ruth Foster and Rod MacVicar. They formed the Centennial School Salmon project which is still an active club at the school. It has received much recognition for its unique and longstanding work. When the hatchery began, there were no salmon left in Mossom Creek. Thanks to the tireless efforts of volunteers over the decades there is now a strong run of Chum Salmon and an increasing run of Coho Salmon. The hatchery also supplies fish to other streams that drain into Burrard Inlet. By reintroducing these salmon, the hatchery strengthens the surrounding ecosystem at various trophic levels. Every year the hatchery releases approximately 100,000 Chum fry into the area and between 5,000 and 10,000 Coho smolts. National Public Lands Day (NPLD) is the nation's largest, single-day volunteer event for public lands in the United States, and many of these activities involve wetlands. NPLD educates Americans about critical environmental and natural resource issues and the need for shared stewardship of these valued, irreplaceable lands; builds partnerships between the public sector and the local community based upon mutual interests in the enhancement and restoration of America's public lands; and improves public lands for outdoor recreation, with volunteers assisting land managers in hands-on work. This is a program of Fisheries and Oceans Canada, which supports salmon incubation in schools. Raising salmon in the classroom is an opportunity to teach students to understand, respect and protect freshwater, estuarine and marine ecosystems, and to recognize how all humans are linked to these complex environments. A number of schools on the East Coast are involved in raising shad. American shad is a migratory fish that used to be prevalent in many river systems on the East Coast. The fish spawns in freshwaters and lives most of its life in the ocean. It plays a very important part of the food chain in these river systems, and American shad played a significant role in the survival of the indigenous people and the first settlers to the New World. Whether you release one American shad fry or 1,000, students will have hands-on activities that will help them learn about food webs, river basins, mapping activities, water quality, and river flow rates. 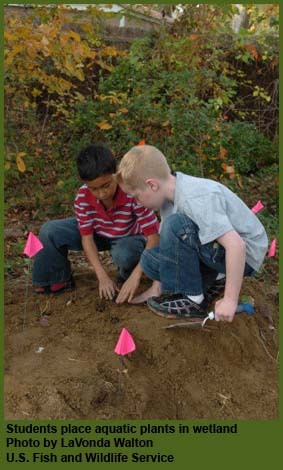 There are several extension activities where students can expand their learning and earn a certificate, or find their ecological footprint. Monitoring streams is a simple but effective way to understand the natural world. Stream monitoring can provide a quick check on the health of the entire watershed, since, whatever happens on the land ends up in the water, sooner or later. Streams can be monitored for many traits and in many ways. This project looks at steams in four different ways. We will examine closely the physical, chemical, and biological nature of our streams. Testing the water quality, survey fish and wildlife habitat, and keeping abreast of land uses in the entire watershed allows you to become an extra set of eyes and ears for interested agencies and ensure that your stream is looked after on a regular basis. Even more importantly, you can become an informed citizen who can collect information to create new on knowledge about our environment. conservation and land stewardship through volunteer monitoring. Thousands of wetlands are impacted and also created/restored as a result of highway and bridge construction. The Adopt-A-Wetland program can be in conjunction with the Adopt-A-Highway program established in the late 1980's. These wetlands are often forgotten and neglected. 6. Assist Departments of Transportation and others in monitoring and improving our natural resources. Many states and local areas of citizen science and/or volunteer activities involving wetlands and watersheds. Here are a few of those organizations but research your area and state for more. Project Tierra is a citizen science wetland biodiversity monitoring project in which students of all ages collect and record environmental data over the long-term to monitor the biodiversity and overall health of the Watsonville wetlands. The overarching goal of Project Tierra is to provide ongoing data regarding water quality, plant populations and bird populations to the scientific community that will inform wetland conservation and land management decisions in the Pajaro Valley. We are especially interested in using this data to evaluate the success of Watsonville Wetlands Watch restoration projects and guide the adaptive management of these lands. Help gather baseline data about Mount Rainier National Park's natural resources, including amphibian populations and wetland resources and soundscape monitoring, from July through September. Some projects require simple day-trips off park roads, while others may occur deep in the park's wilderness and involve multiple days in the backcountry. For further information, or to join our team, review previous blog entries, contact Biologist Barbara Samora, 360-569-6751, or submit an online application.